The rich colors of fall make a wonderful backdrop for your special day so commemorate your autumn event with our personalized fall votive favors. Elegant and simple, these fall favors make a great addition to any décor. The frosted glass votive holders measure 2.5" tall by 2.125" in diameter and contain a poured white tealight candle. You can customize these gifts by choosing a theme, color and text or you can create your own design to be screen printed on the front of each candle. 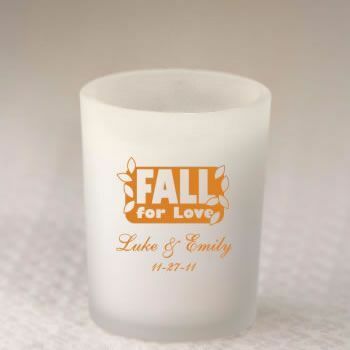 Your guests will love the personalized fall votive favors. This item no longer comes with a poured white votive candle, instead it comes with a white tealight candle.